Killer Characters: The goat came baaaaack! 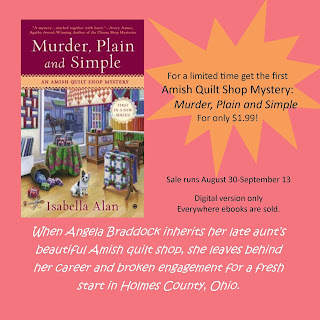 In October, the fourth book, Murder, Plainly Read, chronicling my life in Holmes County, Ohio will release. Isabella Alan is my biographer. I would say she does a decent job, but there are times that I wished she’d leave out some of the more embarrassing episodes in my life. For example did she really have to show how many times I humiliated myself in front of my former fiancé Ryan Dickinson in Murder, Served Simply? 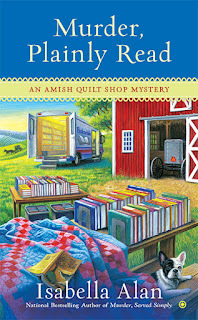 Or did she have to share in detail how many times Petunia the goat knocked me on my backside in Murder, Simply Stitched? I could be wrong—typically I like to give people the benefit of the doubt—but I think Ms. Alan enjoys seeing me blush. In fact, I know she must considering what comes next. In my upcoming biography, Murder, Plainly Read, Ms. Alan is at it again reveling in all the embarrassing experiences of my life. She tells me that it adds to the story and makes me a round person. Did I ask to be a round person? Does anyone want to be described as round? In this book, I am dealing with the status of my relationship with Sheriff James Mitchell, the reappearance of my best friend Rachel Miller’s estranged father, my mother organizing a library book sale, and, oh yeah, murder. 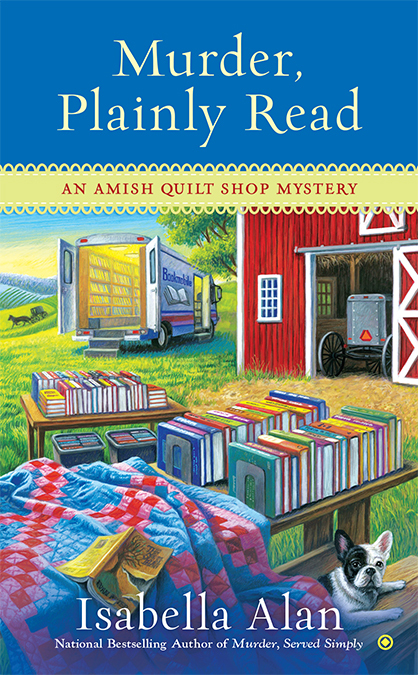 Not just any murder this time either, but the murder of an Amish bishop on a library bookmobile! It’s almost too much for a girl to take even with Oliver my adorable Frenchie and my snazzy cowboy boots to back me up. Added to all that is the return of Petunia the goat. It’s not that I don’t like Petunia, I do. She’s a fine goat, but if what my Amish friends tell me is true and head-butting is a form of affection in the goat world, Petunia likes me a little too much because she's bound and determined to knock me over every chance she gets. I think for the next volume of my biography, Ms. Alan and I will have a little sit down and talk about how much she should divulge. It’s getting downright embarrassing to show my face in Rolling Brook. Embarrassing details, a mystery and a library book sale? Sounds like I can not miss this one! Oh my! I can't believe I have missed reading this series for it sounds like fun. I will be adding it to my TBR list. Hello Angie! Looking forward to your return in October! And so happy to hear Petunia is a new fixture in your life! My, you have a mean author! The only people who like that sort of thing are...probably all her readers. I'll bet you're in for more.